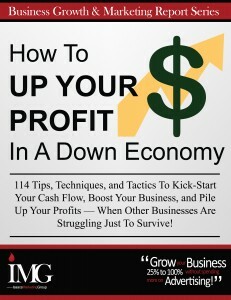 Tags: Grow your business, Increase profits, Increase your profits, Survive the down economy. 1. Become proactive rather than reactive. Most businesses wait for customers to find them. Get out there and market yourself. Let the world know about you on a regular basis. To generate new customers consistently, you need a continuous marketing action plan. Make it a habit to reach new prospects every week – better yet, every day. 2. Spend more time marketing to the customers you’ve already won over. This includes current and past customers who haven’t been active buyers for some time. Stay in touch with periodic publications like newsletters or catalogs. Write, call, fax, email, or mail information at regular intervals. Implement a loyalty program that rewards customers for their patronage. Get infrequent customers to re-order more consistently by simply keeping in touch and presenting new products and different combination packages. Go back to those who bought from you in the past as they’re much more likely to buy from you again. 3. Stay current with local and world events. Consider how these occurrences can affect your business. A new highway can wipe out drive-by traffic to a restaurant on the older route. The recent terrorist attacks in the U.S have had monumental effects around the world. One noted effect is the increase in “cocooning” when people want to spend more time at home with their families where they feel safe. How can you use this trend to your advantage? Think of ways to reach people in their cocoon. Offer shopping-at-home through your website or printed catalog. You could also sell products that enhance the cocoon experience – products for entertainment, security, and extra comfort are some obvious choices.